Earlier this month, I posted a review of a Japanese light novel, Seimaru Amagi's Dennō sansō satsujin jiken (Murder On-Line, 1996), which can be best described to Western readers unfamiliar with anime or manga as Young Adult novels illustrated with manga artwork. Light novels cover a wide variety of genres and the detective story, popular as ever in Japan, has not been overlooked. Murder On-Line is part of The Kindaichi Case Files series and mentioned in my review a number of light detective novels, such as Kazuki Sakuraba's Gosick: Goshikku (Gosick: The Novel, 2003), but the oddest series to be translated is undoubtedly Zaregoto – of which two titles have been published by Del Rey and were recently reissued by Vertical. The series comprises of nine novels that were originally published between 2002 and 2005. Hopefully, Vertical decided to continue publishing the series. 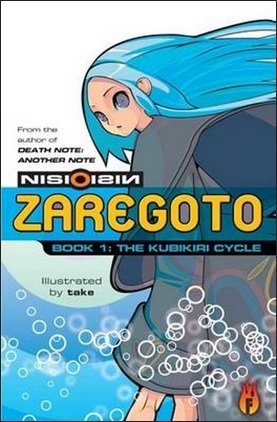 Zaregoto series was conceived by the palindromic "NisiOisiN," a stylized, open penname of Nisio Isin, who debuted with Zaregoto series: kubikiri saikuru (Zaregoto, Book 1: The Kubikiri Cycle, 2002) and won him the 23rd Mephisto Prize at just twenty years of age. NisiOisiN has since worked on a dozen different series and notably penned Anazā nōto – Rosanzerusu BB renzoku satsujin jiken (Death Note: Another Note: The Los Angeles BB Murder Case, 2006). A prequel to the popular Death Note series expanding on the briefly mentioned murder case of the book-title. The Kubikiri Cycle appears on the surface to be traditionally-structured, old-fashioned detective novel, but the zany plot, quirky characters and sometimes schizoid storytelling makes it standout – somewhat comparable to Spiral: The Bonds of Reasoning. This is the reason why this series is so difficult to recommend to readers who have never been exposed to mystery anime or manga series. However, if you're just a filthy casual, like yours truly, you'll find an entertaining detective story in The Kubikiri Cycle with a couple of cleverly thought out and original impossible crimes. Akegami Iria is "the black sheep granddaughter of the Akagami Foundation" and has been exiled to Wet Crow's Feather Island, a tiny speck in the Sea of Japan, where she has lived for five years with her four maids. She has been forbidden to leave this "godforsaken island" in "the middle of nowhere" and, to combat the encroaching loneliness and boredom, she decided to invite the geniuses of the world to her island mansion – who represent every imaginable discipline in science, art and beyond. When the story opens, there are twelve people on Wet Crow's Feather Island. There's a wheelchair bound painter, Ibuki Kanami, who's accompanied by her personal attendent, Sakaki Shinya. A chef extraordinaire, Sashirono Yayo, and famous fortune-teller, Himena Maki, who advises "bigwig politicians and corporate clients." Sonoyama Akane is a scholar of the highest order and member of the ER3 System, a group of geniuses among geniuses, who has risen to the ranks of one of the Seven Fools of ER3. Finally, there's a blue-haired girl, Sashirono Tomo, who's a genius engineer and ex-leader of shadowy group of hackers who appeared out of nowhere during the 1990s. Tomo is accompanied by the narrator and reluctant protagonist of the series, simply known as Ii-chan, but his real name is never revealed and, while prone to downplaying his own abilities, had been enrolled in the ER3 program for five years – before dropping out and returning to Japan. 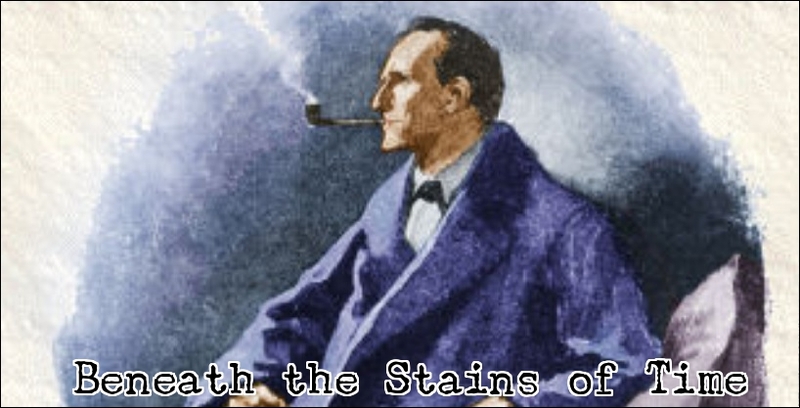 And he's the one who solves the baffling murders on Wet Crow's Feather Island. For the most part anyway. The cast is further padded out by Akegami Iria's four maids. There are three sisters, Akari, Hikari and Teruko Chiga, who are overseen by the head maid of the mansion, Handa Rei. Admittedly, story begins rather slowly with Ii-chan interacting with the people on the island, reflecting on his situation and peppered with the occasional philosophical exchange. Normally, this is merely to establish the characters and pave the way for the plot. However, the narrator here is a little bit different and over the course of the story a picture emerges of a cold, introverted 19-year-old student who prefers to keep people at a distance and observe them. Not get involved in anything. A social hermit with a distinctly dark undercurrent. This makes him somewhat of an unreliable narrator. And, from what I understand, the personality of the narrator is more deeply explored in later installments. The inevitable murder finally happens after an unexpected earthquake rocks the tiny island and the genius artist, Ibuki Kanami, is discovered without her head in a locked atelier, but the earthquake has toppled a shelf with paint cans – creating "a river of paint." There was no way to cross this river without stepping in the still wet paint and, forgetting the closed and locked windows for a moment, this means the murder was committed before the earthquake. Only one person was unable to produce a convincing alibi for this period, Sonoyama Akane. So our narrator conceives a simple, but effective, plan to prevent any further murders: isolate the prime-suspect behind the locked door of the first-floor storage room. If Akane is the culprit, she isn't able to commit any other murders, but if someone else happens to be the murderer, this person is "brought to a standstill." Or so he thought. Akane is brutally murdered in the locked storage room, her head cleanly removed from her shoulders, but the only key to the room was in possession of Hikari Chiga. There's a window, very high up in the wall, which would mean "a two-story dive" if the murderer had entered, or left, through the window. So it was "virtually impossible" for someone to climb out and "even more implausible" that someone had climbed. A third, quasi-impossible crime is committed when someone smashes Tomo's computers to pieces, which had crime-scene photos on it, but everyone present on the island was in possession of an alibi. The Kubikiri Cycle actually begins to resemble one of those traditionally-structured mystery novels from the Japanese shin honkaku school of detective fiction with alibis, sealed rooms and a central trick, or gimmick, nearly as great as the one from Soji Shimada's Senseijutsu satsujinjiken (The Tokyo Zodiac Murders, 1981) – which is where the plot draws is its strength from. Granted, the murder in the room "sealed" by a river of paint bare of any footprints was incredibly simple, but the beheading in the storage room is good representation of the Japanese detective story in all its glory. A corpse in a Western detective novel or short story is (usually) nothing more than a passive, inanimate object with the plot and characters moving around it, but in Japanese mysteries they often turn out to be linchpin of the plot. Keigo Higashino's Yogisha X no kenshin (The Devotion of Suspect X, 2005) is a good example of this. Even more impressive is when a body is used to create, what appears to be, "an uncommitable crime." And it's simply astonishing when a victim turns out to tie everything together: murderer's identity, a well-hidden motive and the locked room-trick, which is exactly what NisiOisiN accomplished here. No wonder they chugged an award at him for this. However, Ii-chan only puts together the bare bones of the plot, but it takes a world-famous detective, Aikawa Jun, to answer the last, unresolved questions and exposes another plot-layer, or two, in the process. Absolutely brilliant! All in all, The Kubikiri Cycle was an incredibly clever, ingeniously constructed locked room mystery told in the style of an anime-detective series with manga aesthetics. The result is a very unusual, but original, piece of crime fiction. 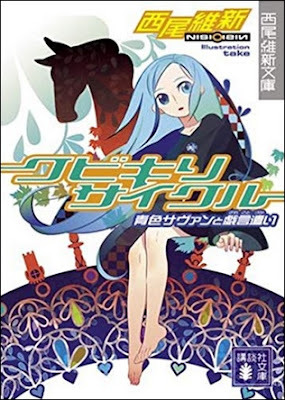 Now that I have finally reread The Kubikiri Cycle, I can move on to Zaregoto series: kubishime romanchisuto (Zaregoto, Book 2: The Kubishime Romanticist, 2002), but don't worry. My next post will be a return to the Western detective story. By the way, Vertigo has reprinted these two Zaregoto titles as Decapitation: Kubikiri Cycle and Strangulation: Kubishime Romanticist. They were reprinted 2017 and 2018. So maybe we can expect the first translation of the third book this year. Here's hoping! I've seen the anime adaptation. Kubikiri Cycle has what is perhaps my favorite locked room murder of all time. It's so simple! Vertigo completely re-styled their editions, even revised the translations, which possibly indicates they have plans to continue the series in the future. So... fingers crossed. Yes, the locked room-trick is glorious. Exactly what you hope to find in a shin honkaku mystery. I can't say that I share your thoughts with this series but this google+ deleting thing is kind of making me nervous.